When the air turns crisp, you know cranberry season is upon us—along with all the sweet and savory dishes that showcase their tart and juicy charm. These shiny red berries come along just in time to costar in great harvest green salads, celebration punches and Halloween recipes—and become a major player in both Thanksgiving and winter holiday menus. In addition to mains and salads, you'll find a cornucopia of tart-sweet treats. Dried cranberries are used in our Cranberry-Apple Pilgrim Pie, and fresh cranberries star in the showstopping Cranberry-Glazed Cinnamon Cheesecake. And if you simply can't wait for cranberry season, have a Cranberry Lemonade Spritzer (made with cranberry juice) and peruse these cranberry recipes until the season arrives! Cranberries are sold in 12-ounce plastic bags making it impossible to select individual berries. 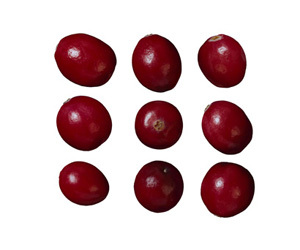 Select bags of mostly firm, plump, unblemished berries that are dark to light red in color. Avoid bags that contain shriveled, soft or moldy berries. Refrigerate fresh cranberries in their unopened plastic bag for up to 1 month. Once opened, place remaining berries in a resealable plastic bag. Freeze them, unwashed, in the original bag or an airtight freezer container for up to 1 year. Rinse fresh cranberries under cold water just before using. Sort through them and discard any soft, shriveled or discolored berries. Do not thaw frozen berries before using. To easily chop fresh or frozen cranberries, pulse them in a food processor to the desired texture. Substitute some of the apples or pears in your favorite crisp or cobbler recipe with fresh cranberries for holiday color and great flavor. Top a brick of PHILADELPHIA BRAND Cream Cheese with some homemade cranberry relish or sauce and serve with crackers for a festive holiday appetizer spread. Toss chopped fresh cranberries into muffin, coffee cake or quick bread batter in place of blueberries or other fruits. Add a holiday touch to STOVE TOP Stuffing Mix by stirring in fresh cranberries during preparation. In addition to relish or sauce, use fresh cranberries to prepare homemade jellies and jams. Jazz up your favorite JELL-O Gelatin molds by adding sweetened chopped fresh cranberries.